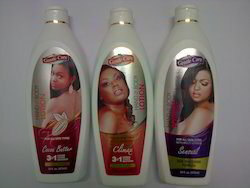 Manufacturer of a wide range of products which include body lotion. Enriched with Multi Vitamin to help bring out natural fairness of skin. Each spread cares for your skin, furnished with a luminous aroma. Leaves your skin scented. Rub thoroughly onto your body and hand. For best result apply daily after every bath and whenever necessary. For external use only. Avoid contact with eyes. If condition worsens or does not improve within 7 days, consult a doctor. Not to be applied over deep puncture wounds, infections or lacerations. Keep out of reach of children.